How is it Monday already? Did this weekend fly by for anyone else? 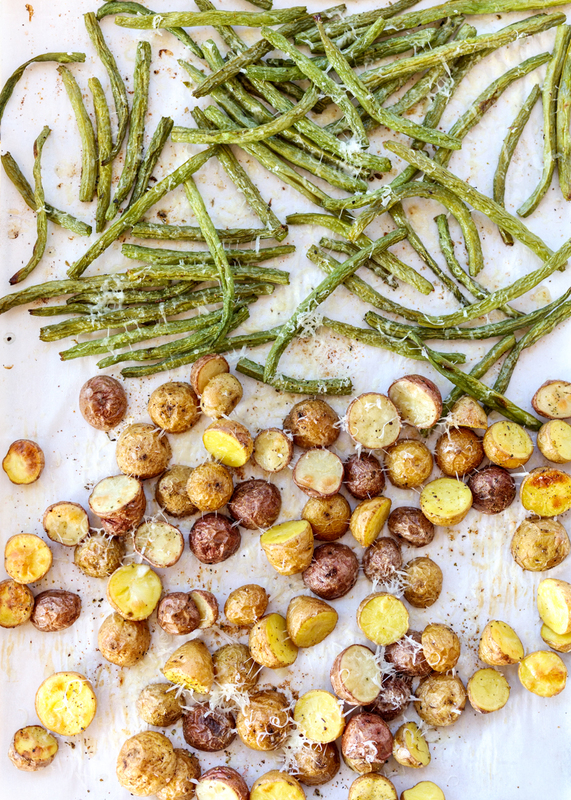 Hopefully I’ll make it a little better with this quick and easy recipe for Sheet Pan Parmesan Roasted Green Beans and Baby Potatoes. Cheese makes everything better, right? 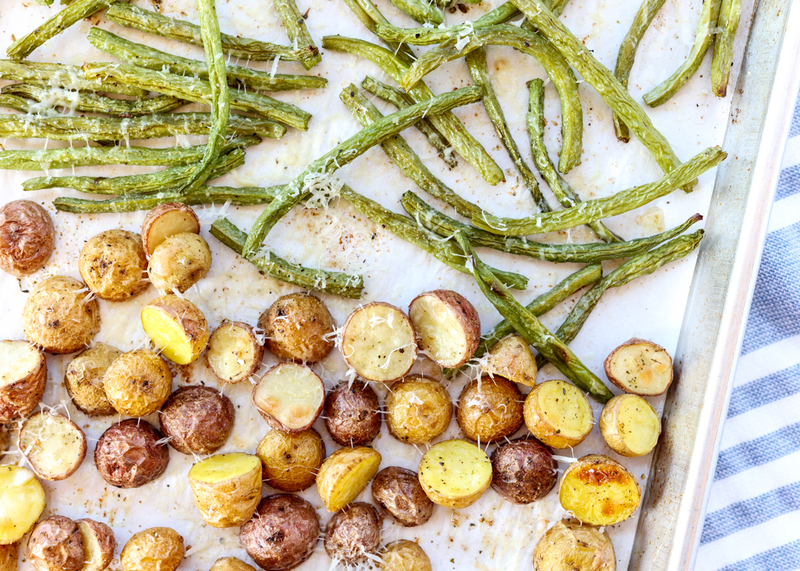 Especially when the Parmesan is coating charred green beans and crispy potatoes. I’m not sure if you’ve noticed, but I love cooking meals in the oven. I know you’re probably thinking, “oh yeah, oven cooking in the winter is great and cozy,” but I mean I love-love it, like even when it’s 80 degrees in the summertime. 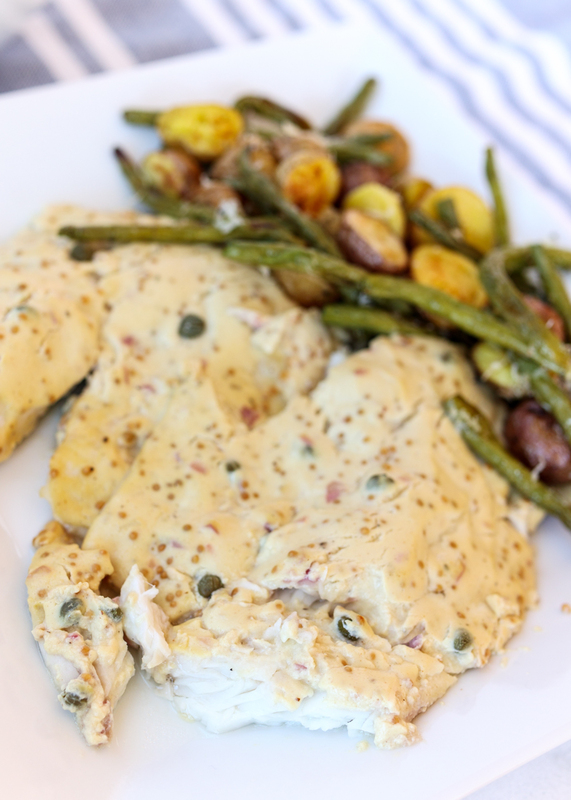 Oven cooking is just so easy and even though I love cooking I also love easy cooking. 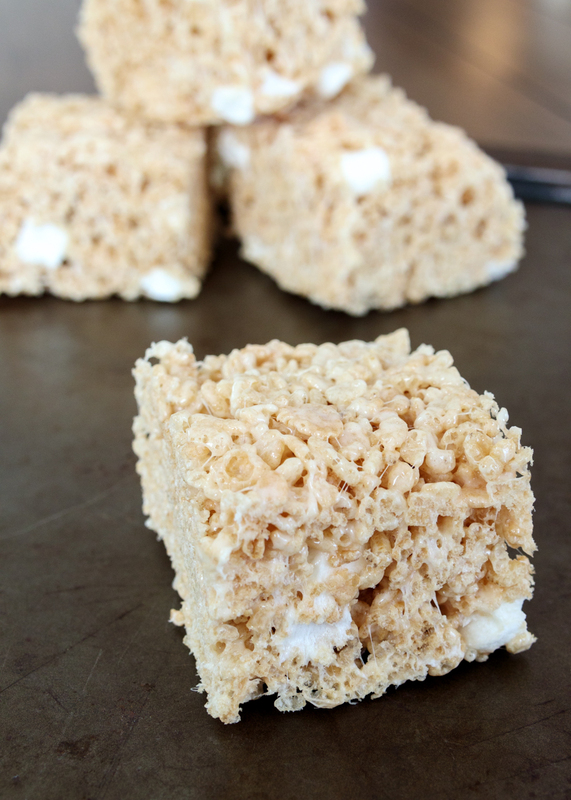 Plus, the crispy textures and caramelized flavors you get from oven cooking? Delicious! 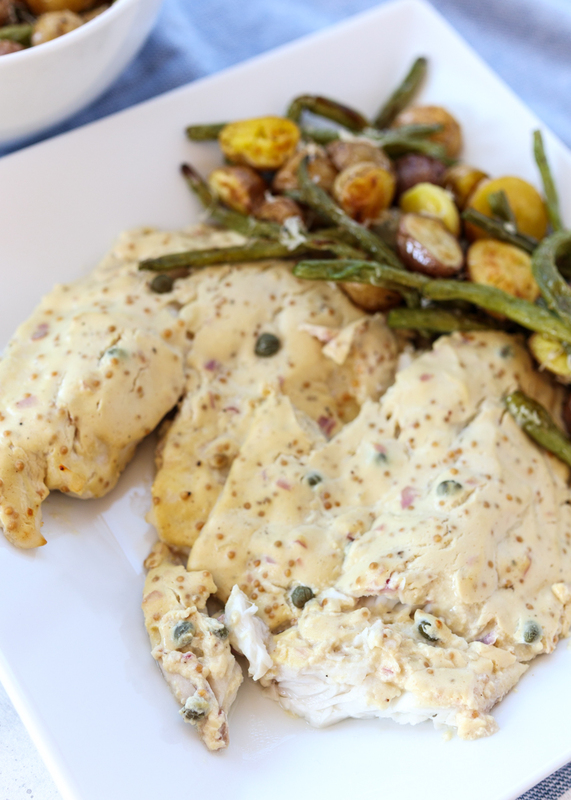 I do default to our large toaster oven for most oven meals since it preheats so quickly and doesn’t warm up the kitchen, but I will definitely heat up the kitchen if it means I can just throw everything on a sheet pan and have it come out perfect while I work on other stuff like writing this post. Or watching Netflix – getting through all those shows is important work! 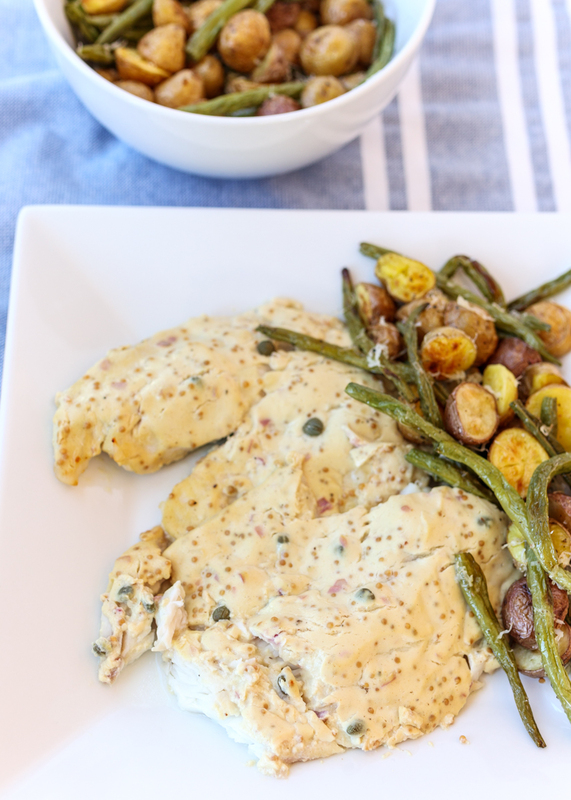 If you’ve never had roasted green beans then you will be instantly hooked. 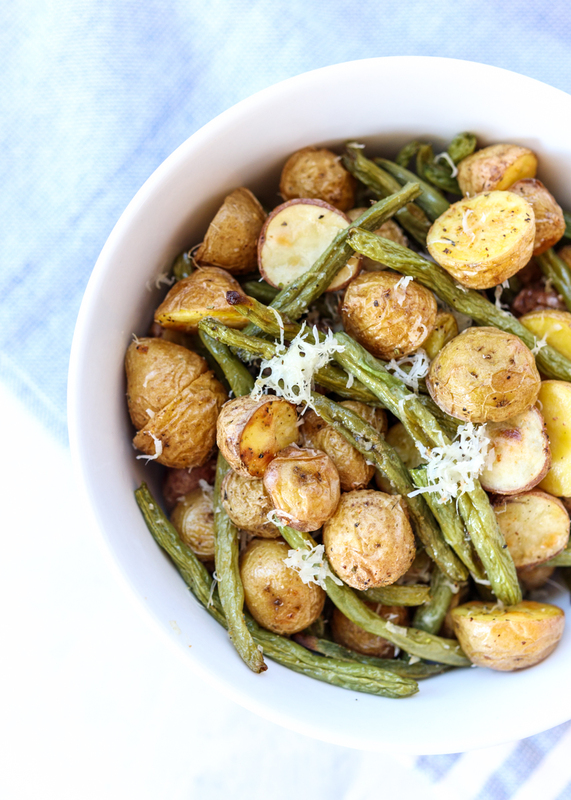 It’s difficult to beat crunchy on the outside and fluffy on the inside roasted potatoes, but these green beans come close! 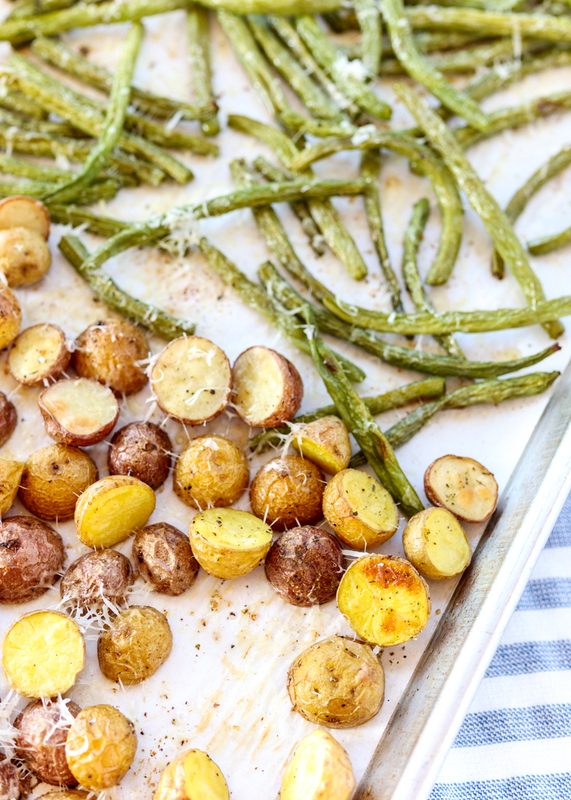 Simply tossed with some olive oil, garlic powder, Italian seasoning, ground black pepper and some fresh grated Parmesan, this roasted sheet pan side dish is easy cooking perfection! 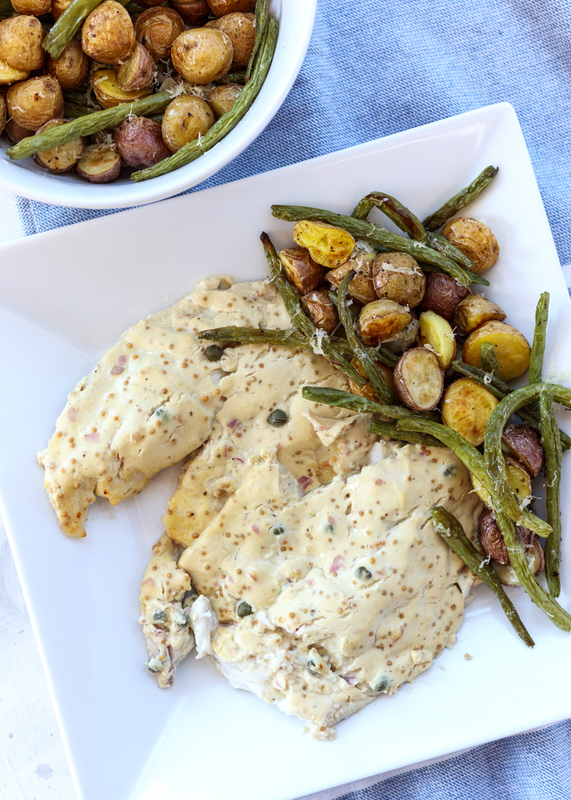 Toss the halved potatoes and green beans with the olive oil to coat then toss with the garlic powder and Italian seasoning. Season with salt and pepper. 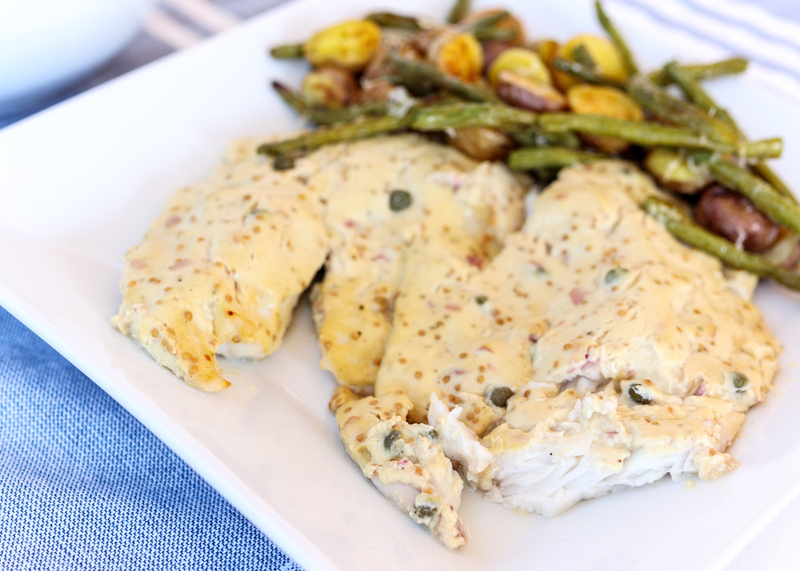 Spread out on a baking sheet lined with nonstick aluminum foil or parchment paper. 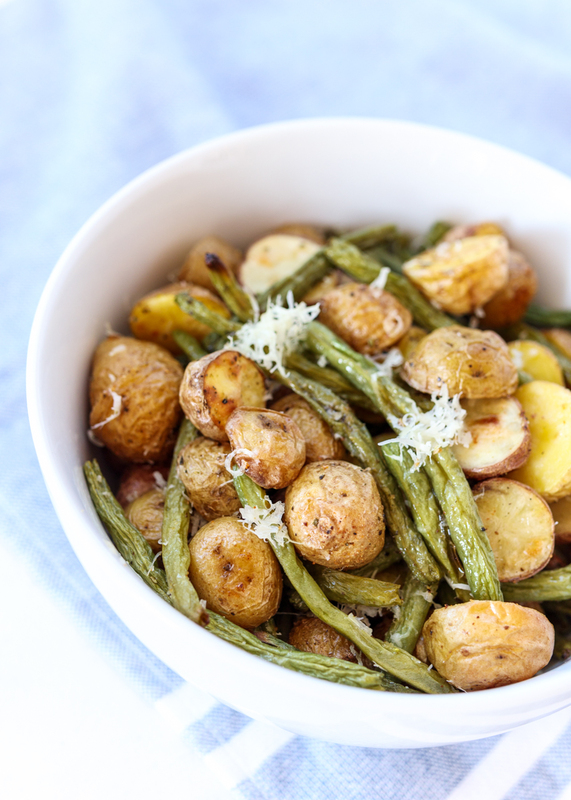 Roast for 25-30 minutes, tossing the green beans and potatoes after 10 minutes. Immediately top with the Parmesan when out of the oven. Do you cook from cookbooks often? I have a few cookbooks that I’ve made countless recipes from and have shared on here: Rachael Ray’s Look + Cook, The Perfect Scoop, Cook This, Not That! and Pati’s Mexican Table. Then I have a whole bunch of cookbooks that I’ve drooled over the pages of many, many times, but that I have yet, years later, to make any of the recipes. Every year I say that this will be the year I cook from all the cookbooks I’ve never used before, but this year I mean it and I’m already off to a great start! 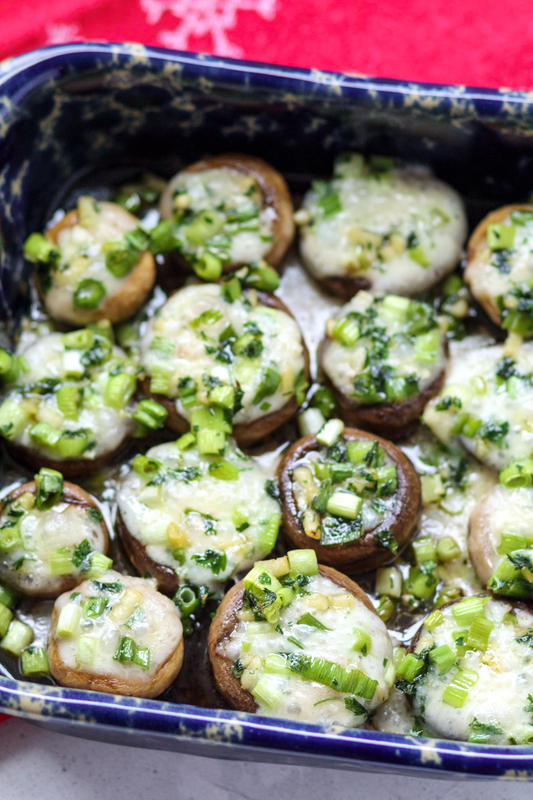 In addition to a few recipes I have picked out for the blog, like these epic Brie-Stuffed Mushrooms, I thought maybe I would be more motivated if I turned over some of the selection power to Matt. Last month Matt picked a cookbook I haven’t cooked anything from yet along with a recipe from that book and then we cooked it together. It wasn’t for the blog so there was no pressure for it to look good or to be made during daylight hours for photograph reasons. January’s pick was an Eight-Hour Skirt Steak with Balsamic Mushrooms from Sous Vide at Home, which he had gotten me last year. Matt cooked most of the dish himself and it was incredible! This month, Matt picked the Half Baked Harvest Cookbook, who is one one of my favorite food bloggers, and we’re going to be making her Farmhouse Cheddar and Angel Hair Frittata next week. 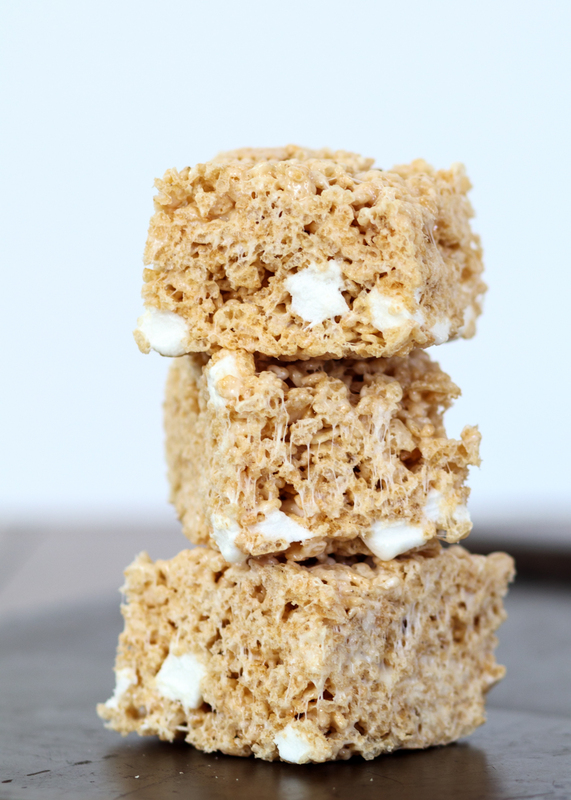 Yum – I can’t wait to try it! 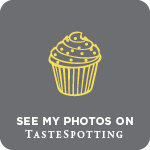 I’m liking this new monthly tradition, although if any of the recipes become new favorites then I of course will have to re-make them to share with you all! 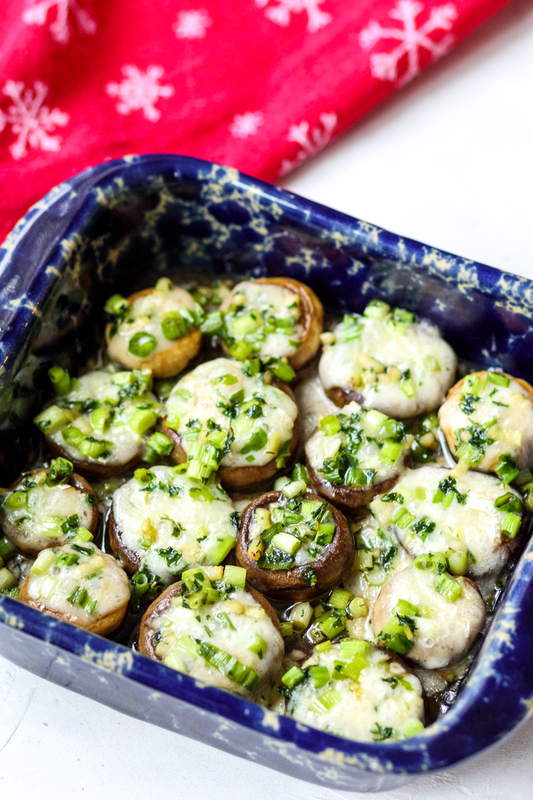 Today I’m sharing these cheesy, garlicky and buttery Brie-Stuffed Mushrooms from The Pioneer Woman Cooks: Food from My Frontier, which is Ree Drummond’s second cookbook. 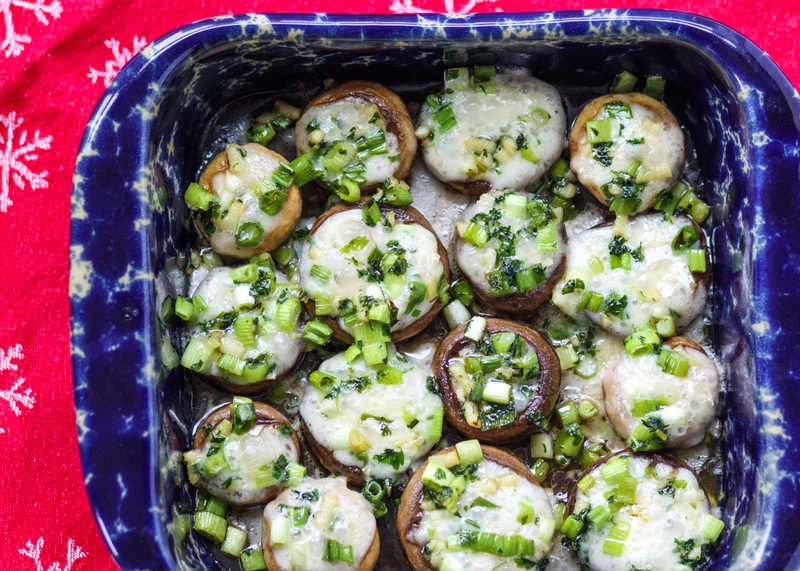 Button mushroom caps are lightly sautéed in butter before being stuffed with chunks of creamy brie cheese and baking in the oven. 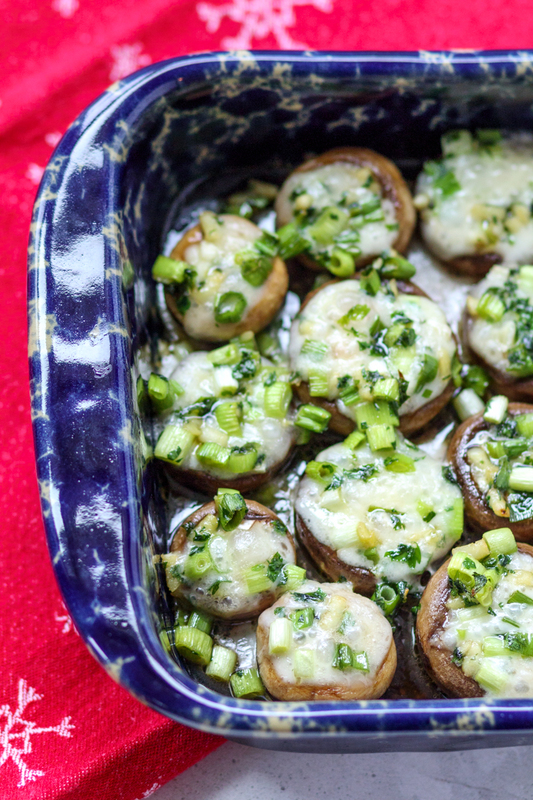 The best part is the sautéed parsley, garlic and green onions that get poured overtop the mushrooms. This party appetizer is so simple, but looks really fancy, making it perfect for the holidays or even an Oscar party! 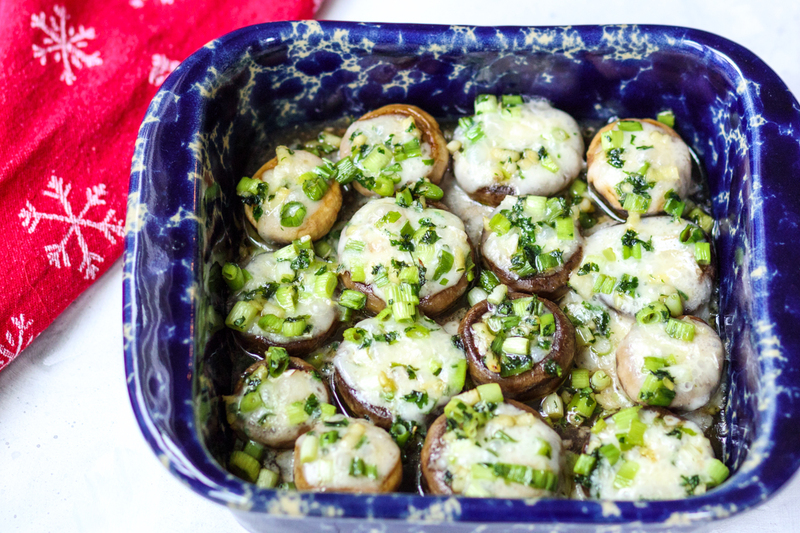 According to Ree, “Guests will kiss you and demand to be invited back next time” so make sure you make these mushrooms for company you like! Are you excited for the Oscars? Matt and I missed all the best picture nominees in theaters except for Black Panther, so we’re going to be streaming some of them this weekend to try to catch up. This article shares where to watch all the best picture nominees if you’re interested. Have a great weekend, everyone! In a large skillet over medium heat, melt the butter then add the mushroom caps. Toss the mushroom caps in the melted butter. Lightly season with salt and pepper then let sauté for a minute. Remove from the mushrooms from the skillet. Add the parsley, garlic and scallions to the skillet. 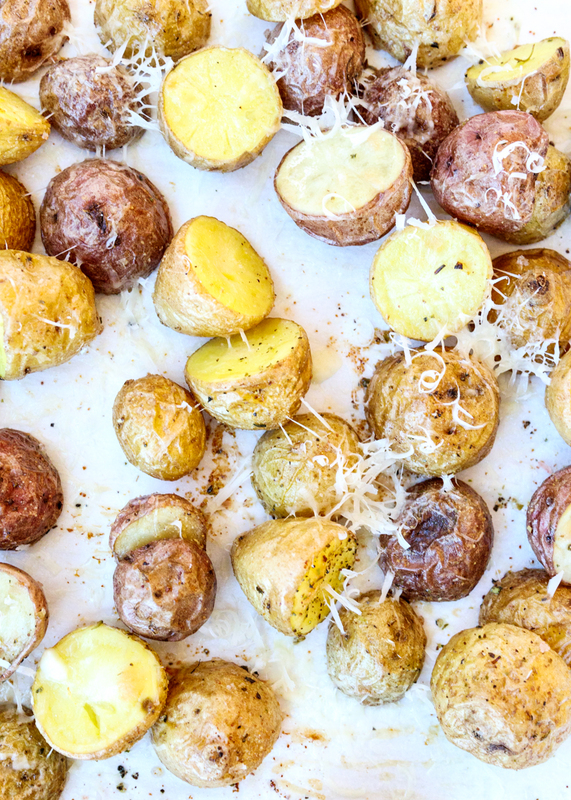 If you’re using the white wine, add it now. Cook for 1-2 minutes, stirring frequently, then remove from the heat. Place the mushroom caps, stem-side up, in a baking dish. 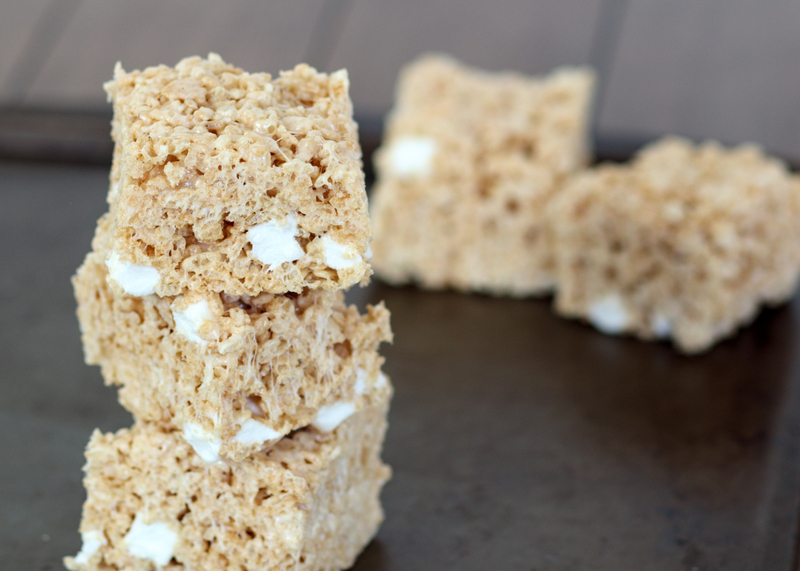 A square baking pan or pie dish works well. 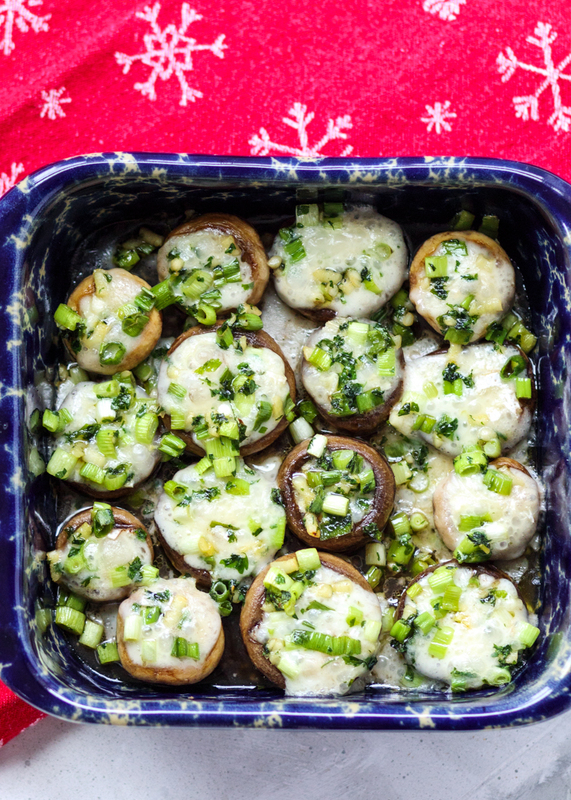 Add a chunk of brie to the opening of each mushroom cap then pour the parsley mixture over the top. Bake until the cheese has melted, about 15 minutes. 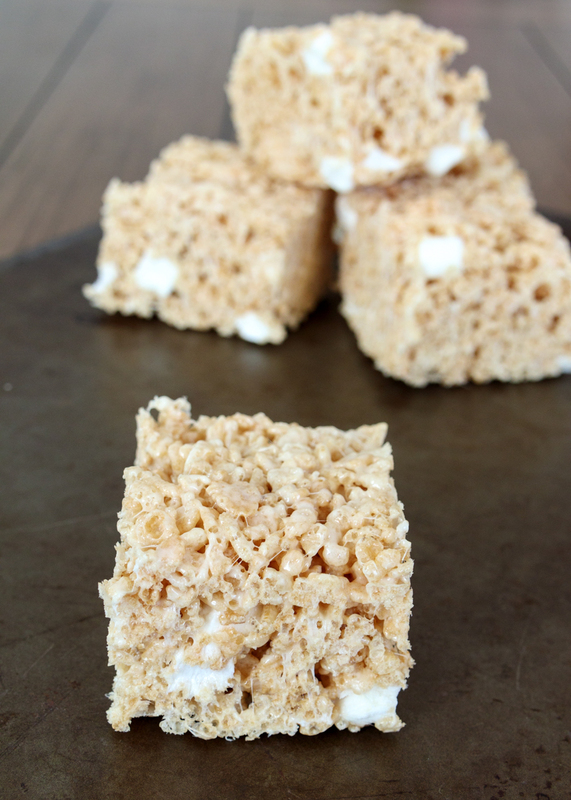 Serve them after they’ve cooled slightly. 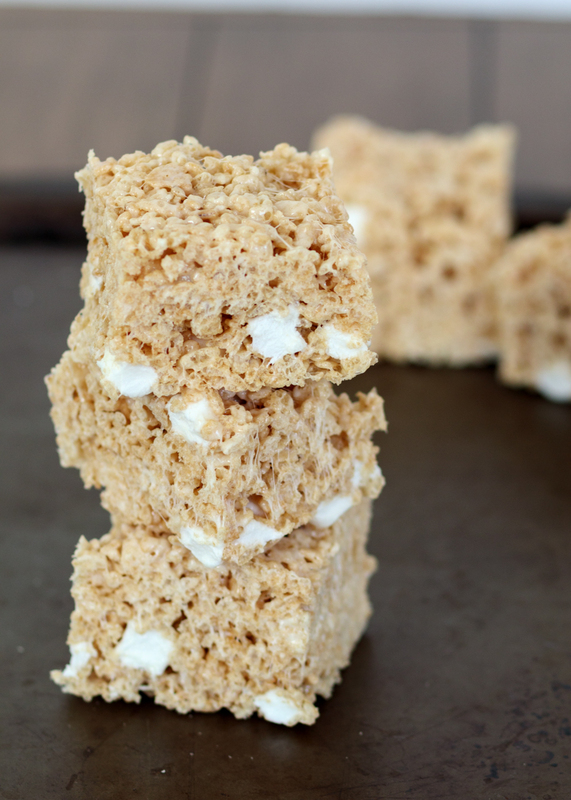 Recipe from The Pioneer Woman Cooks: Food from My Frontier. I only post salads when I’m obsessed and this is definitely one of those times. 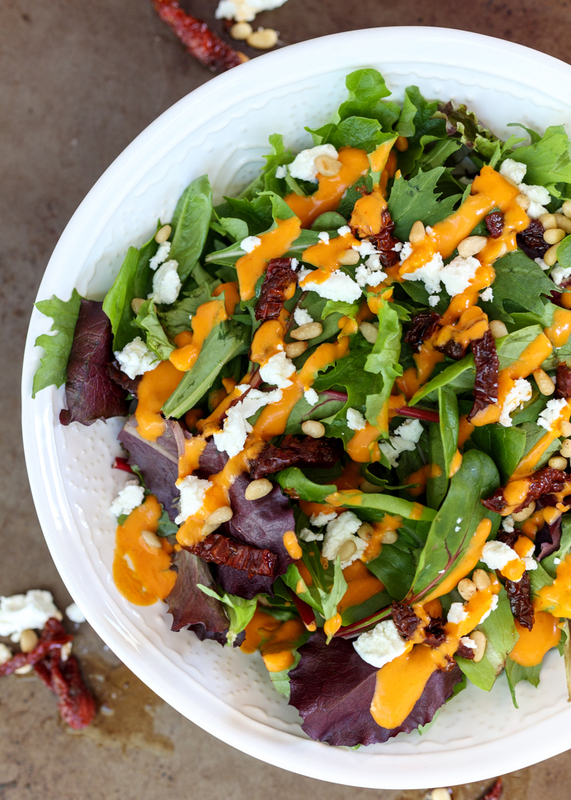 This Mediterranean salad has mixed greens, toasted pine nuts, goat cheese, sun-dried tomatoes and a creamy and tangy roasted red pepper vinaigrette. It sounds so simple, but the combination will make you start craving cold salad in the middle of February. 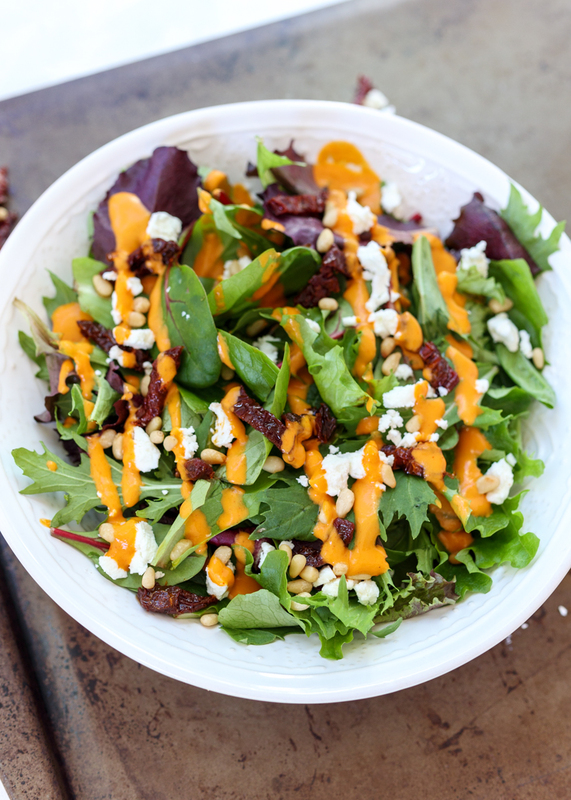 The inspiration for this salad came all the way from a restaurant in Colorado. Matt and I just got back from spending an awesome week skiing out in Colorado with my parents and brother! As I’ve mentioned before, my brother lives in Colorado so it’s the perfect place for a family reunion vacation during the wintertime. While we were out there we got a ton of fresh snow, raced each other down the mountain and of course ate plenty of good food. One of my favorite dishes from a restaurant we typically go to is this Mediterranean Salad with Roasted Red Pepper Vinaigrette. I started thinking about it the weeks before our vacation was going to start and decided that since it’s so simple I should just try to recreate it myself. I’m not quite sure why I waited so many years to do this, but I’m so glad I did! There’s something magical about the crispy and nutty pine nuts with the creamy goat cheese and the rich sun-dried tomatoes. Side note: I wrote this in the recipe, but make sure you use the sun-dried tomatoes that come in a jar packed in oil, not the ones that come in a bag. The roasted red pepper dressing is just five ingredients, but it takes the salad to a whole new delicious level. A roasted red pepper, olive oil, red wine vinegar, smoked paprika and salt to taste get pureed in a high-speed blender until smooth and creamy. 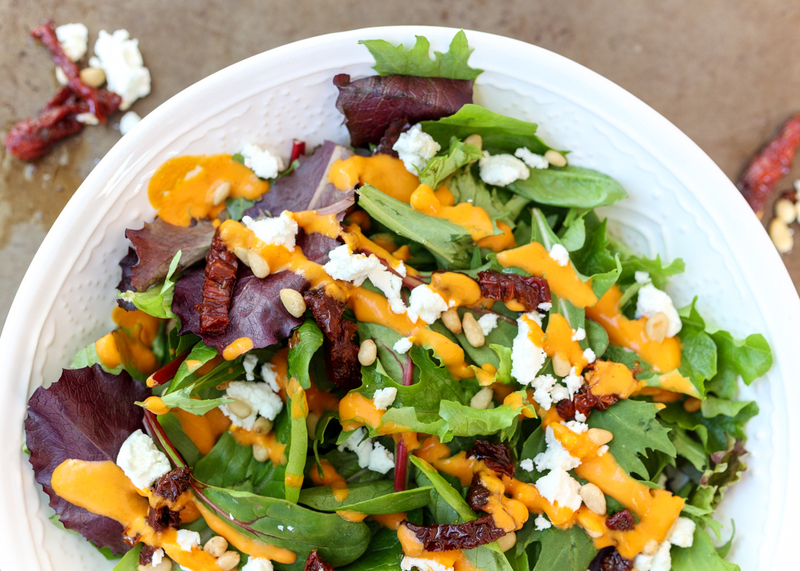 The dressing adds to the tanginess of the sun-dried tomatoes and gives the whole salad a zing that balances the goat cheese. We actually didn’t go to that restaurant this past week as this salad is the only standout dish from there, but I don’t even mind because now I can make it for myself whenever I want! Yum! Roast the red pepper. Preheat the oven to 400 degrees F. Spray a baking sheet or aluminum foil covered baking sheet with nonstick cooking spray. Wash and dry the red pepper then place on the baking sheet. Bake 20 minutes, flip the pepper over then bake for 20 more minutes. When the pepper is cool enough to handle, remove and discard the skin, stem and seeds. Make the dressing. Add the roasted red pepper, olive oil, red wine vinegar and smoked paprika to a high-speed blender. Blend until smooth then season with salt and pepper to taste. 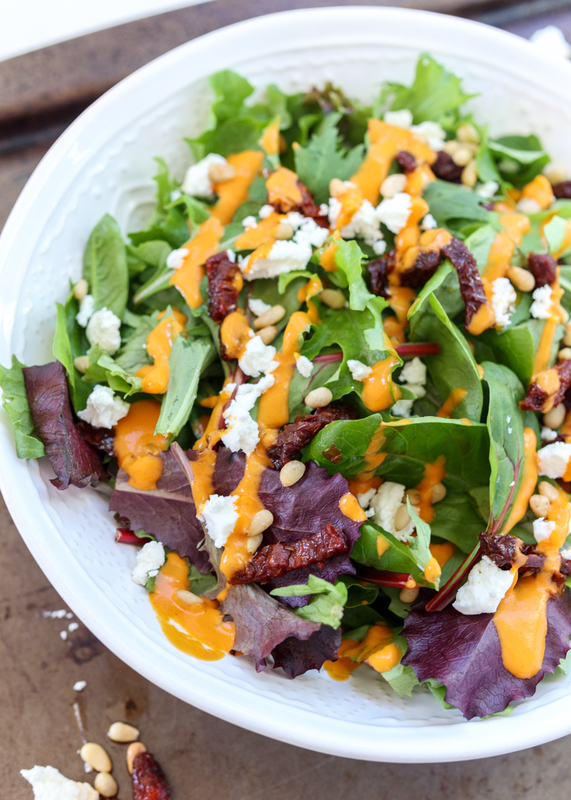 In a large mixing bowl or salad bowl, toss the salad greens with the pine nuts and the julienned sun-dried tomatoes. 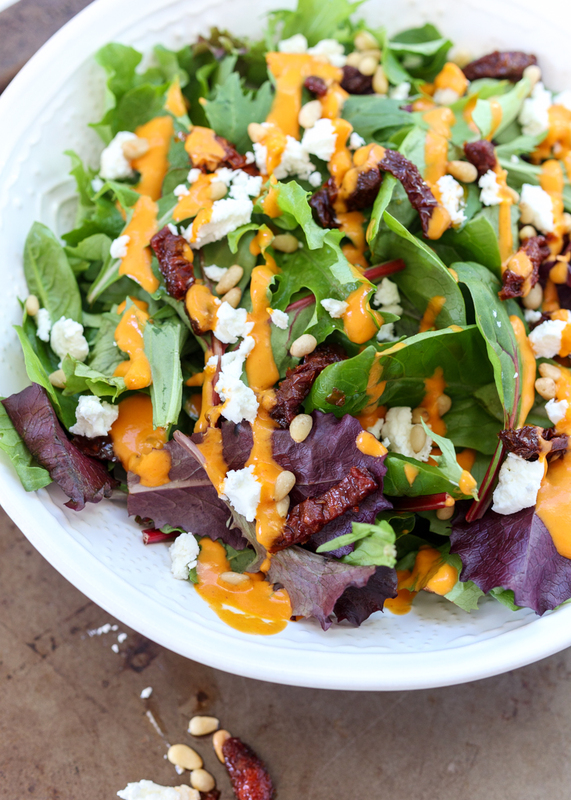 Add your preferred amount of the roasted red pepper dressing and toss. Crumble the goat cheese over top and serve.